When I first found out that both the tv movies and the complete series of the Seventies tv show, Man From Atlantis, were being released on DVD, I was ecstatic. It’s a show that I have vivid memories of from my childhood, but I haven’t seen it in over three decades. 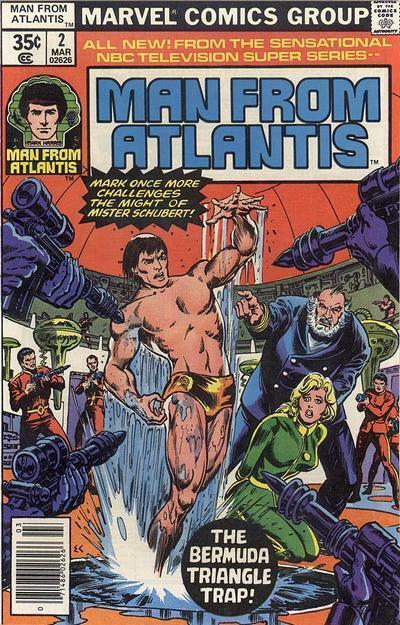 Super-heroes were a rarity on television and film back then, and Man From Atlantis joined the aquatic crimefighter pantheon that included Namor, the Sub Mariner and Aquaman. I also was able to chat with Man From Atlantis star Patrick Duffy, who has gone on to be one of tv’s most iconic actors in such series as Dallas, Knots Landing, Step by Step, and The Bold & The Beautiful, as well as dozens of guest appearances. Mr. Duffy was kind and engaging as we chatted about his career, the return of Dallas, his legacy and Man From Atlantis. I have such an affection for this show, and I’m glad that it’s finding airtime again, even if it’s individually in private homes, by virtue of ordering on-demand. I’ve always wished that we had more episodes, because then it could’ve been syndicated. It might’ve had a shelf life in ancillary broadcasts. We just didn’t have it. It was just not possible. So, this is the window, and I’m thankful. And I’m also thankful because it means that a lot of the history of the television industry is going to be available again, where it wasn’t viable, you know, because a cable channel couldn’t promote it and advertise it, because it was too short. And I’m looking forward to looking at what their catalogue is going to include, and I think it’s going to be a lot of memories that I grew up with on television, and I’m going to order some of them. I remember watching the series, probably when I was about six years old, and even though I haven’t had the chance to revisit it yet, I really have some pretty vivid memories of the show. What was the experience like for you? Well, first of all, this was my first television show. I was a mid-20’s actor. I was a carpenter by trade, and then I turned around and I’m the head of my own network primetime show. It was a game changer for me, a real life shift. And it was an adventure. It was science fiction, it was Buck Rogers, it was me being on a sound stage – first of all, was very exotic, but to be on a sound stage where they’re trying to do all of this strange science fiction underwater stuff was so exhilarating, that you could put a gun to my head now and I wouldn’t do half the things that I volunteered to do in 1976. I read that you grew up reading comics, actually. Did this affect your approach for playing Mark Harris? Well, I think it did. I think, reading the comics, definitely I had a sense of heroics and of the seriousness of heroics. When you read comics, those characters never have their tongue in their cheek. They’re completely committed to whatever character and heroic act they’re trying to accomplish. The second thing was, I was a classically trained actor, and I have a sense, I guess somewhere in me, after all that training, of a costume drama reality. In other words, I feel as real in an Elizabethan costume as I do in my Dockers and my Costco wardrobe. And that’s helped me. I felt as comfortable in a swimming suit, when everybody else is in tux and tails, as Mark Harris, as I felt wearing a pair of jeans. I think all of that helps. I think it’s all part of the ease. I think everything is real. Whatever I’m doing I think it’s absolutely real, and I don’t have to force myself to think that it’s real. “Oh! I can breathe underwater, so now this is normal. I’ll breathe underwater,” or I’ll wear a pair of tights and a sword and speak Elizabethan English. “Oh, that’s OK. I can do that too.” So all of those things help. The character definitely had a very specific way of swimming. Was that something that you developed? Well, the stunt coordinator, who was very famous in Hollywood – water stunt coordinator, a man named Paul Stader. He and I worked together, because the producer who originally wanted to have the Man From Atlantis swim like a fish, which fish do because their spinal cord works exactly 90 degrees different than a human’s. And we tried a couple of sideways movement and couldn’t make it work, and it didn’t work and it hurt. As a competition swimmer, Paul, just said, “Well, it has to be the dolphin kick from the butterfly.” So it just felt right. We took the arms out and then, all of a sudden, the Man From Atlantis was swimming across the pool. For several years, there’s actually been a lot of talk about either a feature film or reimagining of Dallas, and essentially, it seems like they’ve gone to do a sequel. What’s it like, after all this time, to reprise your role as Bobby Ewing? It’s hard to say how wonderful it is, because Larry (Hagman) and Linda (Gray) and I never thought – and Larry and Linda are two of my best friends, and have been for 30 years. We’re like “The Three Musketeers” here. But, we never thought we would work together again, and because we are so identified with those three iconic roles, we knew that no producer, director, company, et cetera, in their right mind would put either the two of us in any form or the three of us together in a project, because it would ruin it for the project. Everybody would just say, “Oh, there’s J.R. and Bobby and Sue Ellen.” So we never thought we’d work together again. The two things that are so fun about doing Dallas again on TNT is that we get to work together again, and we get to work as these characters. We know these people so well that when we went to work the first day, it was just like we’d been on vacation for three months and we’re back doing the series. It was fantastic. And I love this character, and I love J.R.’s character and Sue Ellen’s character. And we just think we’re the luckiest three actors in the industry right now. It’s hard to say something really good about yourself without sounding like you’re bragging. But, over the years, as you mentioned, there have been so many ideas put forth about a feature film or whether John Travolta could be J.R., Shirley MacLaine could be Miss Ellie – all of this stuff. And we read those scripts. They were never good scripts. Dallas can only be done as a series. It’s just the nature of the beast. And when Cynthia Cidre , the writer who wrote the pilot, and is now executive-producing the show, submitted her script, and Larry and Linda and I saw it, we all three thought it was the best script we had read, not just since Dallas has been off the air, but it’s one of the better scripts that Dallas could’ve ever done. It’s a perfect time and I guess everything, if you wait long enough, is going to happen at the right moment. You’ve also written the first novel of a proposed trilogy of Man From Atlantis books. Is there a publisher already? No, there’s not a publisher. That’s the first lesson I learned, and every writer would probably shoot me right now, but it wasn’t hard to write the book. The hard part is the business that comes afterwards. And it’s laid dormant for several years. I haven’t really dedicated myself to finding a publisher. Again, like I just said, everything happens at the right moment. The fact that Warner Brothers and TNT are producing Dallas, Warner Brothers archive is re-releasing Man From Atlantis – I have a feeling that this book now, and then part two and three, which I will write if the first one gets a nibble, will happen. I have a feeling it’s just all waiting for the right moment, and that moment is approaching rather quickly right now. Does the novel pick up where the character will be in the present day? Is it set in the ‘70’s? Or is it something else entirely? It’s in the present day. Well, it’s the present day five years ago, so there might be a few things I have to update. The only thing I can remember, off the top of my head, that would indicate it is there’s a computer in the book that I wrote that uses the Intel 14 chip, because I thought I would go far enough into the future that it would make us something. But I think Intel is catching up to me, so I may have to add a few numbers to it. In addition to Man From Atlantis and Dallas, you starred for several seasons on Step by Step, which was essentially a Brady Bunch update. But since then, you’ve done guess shots on Family Guy and South Park, and have the web series, Patrick Duffy and His Crab. Do you find comedy as fulfilling as drama for you? How do you feel about your place in pop culture? Well, I think I’m making my place in pop culture. Certain things I’ve done were iconic by their definition. Dallas as a show was iconic. I think Man From Atlantis is iconic only because it was new and different, and nothing had been done like it before. I have the fortune of having children, who are in their mid-30’s now, who think the best thing I’ve done, in terms of pop culture, is being the left leg of Scuzzlebutt or being on Family Guy. 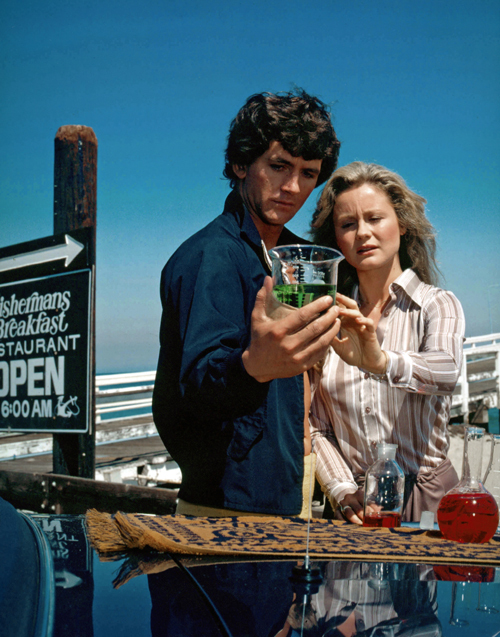 And now, my other son produced and directed Patrick Duffy and the Crab. I just think there’s a redefinition that happens all the time, and you either accept it and go with it, or you solidify and stay where you were, and I’m fortunate to have people who advise me to just keep moving forward. And I take their advice. I think I am a part, just by luck, of pop culture, and I’m very proud to be so. Man From Atlantis is now available on DVD from the Warner Archive. Dallas returns next summer to TNT. THE MAN FROM ATLANTIS Has Arrived On DVD! Interesting take. Color me intrigued. Thoughts? Tonight, On A Very Special BREAKING IN…COMIC-CON! 5 Questions With Game Show Legend WINK MARTINDALE!